Aziz’s talk of emergency seems more ominous, evoking not only earlier moments in Pakistani history but also the notorious Emergency declared in India during the 1970s. 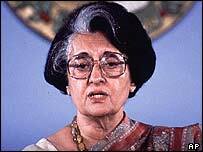 Facing growing political opposition and an unfavorable judicial decision that would have tossed her from office, Indira Gandhi instead tossed Indian democracy itself to one side, manipulating constitutional provisions authorizing the declaration of emergency to suspend fundamental rights, censor news coverage, detain tens of thousands of political opponents and others, and effectively rule by decree. Pakistan seems to be facing a similar moment. With elections required by the end of this year, Musharraf has been maneuvering for a way to remain President while retaining his post as Army Chief of Staff, which would appear to violate the Pakistan Constitution. (Indeed, Musharraf has already violated his own promise to give up either his post as Army Chief or his civilian post as President by December 2004.) A state of emergency could provide a convenient pretext for Musharraf to postpone elections and prolong his hold on power. At the same time, given the depth of political opposition that the Chaudhry affair has exposed, one has to cringe at the thought of what it might take for the Pakistan Army to meaningfully enforce any declaration of emergency. So far, there seems little basis for even a pretextual declaration of emergency. But the Chaudhry Yatra proceeds this weekend to Karachi, where Chaudhry is scheduled to address the Sindh High Court Bar Association. Chadhury’s supporters have scheduled an anti-Musharraf demonstration, and in response the pro-Musharraf MQM has scheduled a counterdemonstration to take place at the same time nearby, which Musharraf opponents allege has been planned in a deliberate attempt to stir up violence. 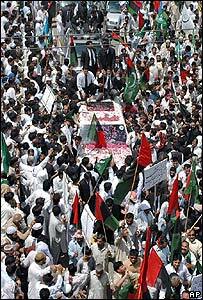 (Musharraf also has scheduled a political rally of his own to take place at the same time in Islamabad.) Karachi is understandably on edge in advance of the competing demonstrations, for which the state government is planning to deploy 15,000 police.